Given the complicated relationship that most people have with money and the dramatic influence that money has over so many aspects of human life, it is hard to dismiss the synchronicity of the original meaning of the Latin root: warning. The word money can be traced back to one of the earliest Roman mints, a temple devoted to Juno Regina located on top of one of the seven hills of Rome, Capitoline Hill. In Roman mythology, Juno was Jupiter's wife and considered to be the patron goddess of Rome. Like other Roman gods and godesses, Juno had a number of different epithets, which can best be understood as aspects of a divinity that represented particular roles, essences and/or locations associated with the being. One of Juno's epithets was Juno Moneta, who was responsible with protecting Roman's financial stability. The name Moneta is derived from the Latin monēre, which mean "to warn or advise," and Juno Moneta is cited as warning Rome of impending danger on multiple occasions. 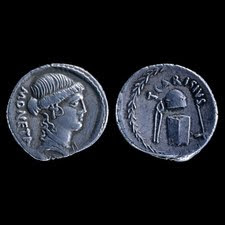 Depending on which etymologist or historian you believe, the Latin moneta had already come to mean minted coin by the time that her temple became a mint or the temple was used to coin money in deference to Juno Moneta's assistance with previous financial matters. The most likely story in my opinion is that coins from the Juno Moneta temple came to be referred to generically as moneta, which eventually became the root of the primary word for money in many languages, and the Moneta temple became shortened for anywhere money was minted. Monitor and admonish is one of the few English words that use the earliest meaning of the root as a warning or advice. There is actually quite a bit more to this story that I will try to follow up on another post soon. Oddly enough, monera can be trace back even further, and the words money, mind, memory and more. There is also something to be said for an alternate history in which money is related to various words meaning single and unique (monarch, mono- , etc) that we might be able to tie into all of this. Rather than going down that rabbit hole just yet, let's just take the Moneta temple up through the present. Well after moneta had come to simply mean cash, it entered Old French as monnaie where it eventually entered Middle English around the 13th century as moneie and, finally, money. please follow on the site "www.rscbux.com"